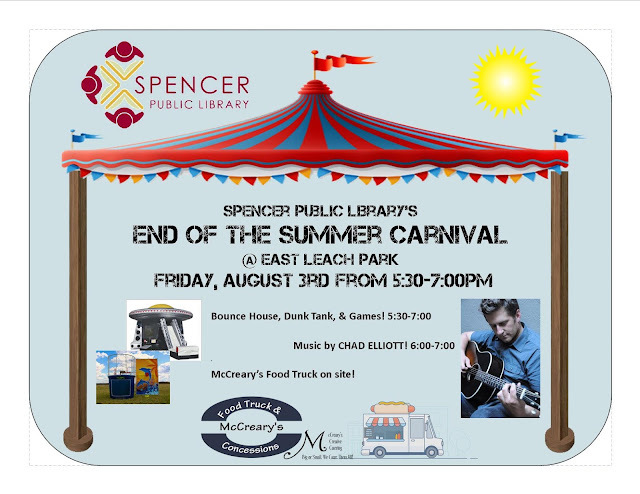 News at Spencer Public Library: Free Carnival For All + Dunk Tank Volunteers? Free Carnival For All + Dunk Tank Volunteers? You and your families are invited to a carnival this Friday, August 3rd, at East Leach Park from 5:30-7:00. This will be a fun and FREE event. If anyone is interested/willing to volunteer to be in the dunk tank at some point Friday evening, just email or phone Sarah Beth to let her know. The library decided to amp up our annual End-of-the-Summer Reading Program Carnival and invite the whole community to join in the fun! In addition to carnival games/prizes, there will be a bouncy house and dunk tank from 5:30-7:00, Chad Elliott will be performing music from Wilderman's Tales 6:00-7:00, and the McCreary's Food Truck will be available throughout the evening.